Products sourced directly from the Rainforest are helping to protect it and the biodiversity that needs it to survive and thrive. Leading this growing ‘Rainforest to table’ movement is Canopy Bridge — a sourcing network bringing together businesses, producer associations and community groups who are buying and selling natural products. By helping create easy, direct connections, transactions and sourcing decisions are more transparent and fair, removing the need for unnecessary intermediaries. 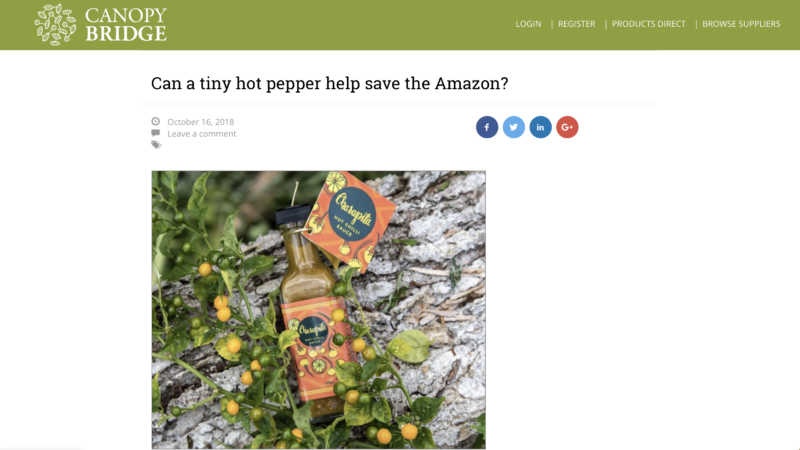 A few months ago Canopy Bridge interviewed Jenny Henman to find out more about our ethical brand, Charapita Hot Chilli Sauce, launched earlier this year. And this week we’re pleased to say they’ve released an article all about it! Head to the Canopy Bridge website to read more via the link above, and if you’re excited about trying Charapita, why not sign up to the newsletter and be one of the first to know when it’s available to buy.